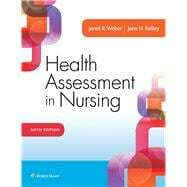 by Weber, Janet R.; Kelley, Jane H.
Now in its sixth edition, the innovative, systematic, and easy to understand Health Assessment in Nursing has already helped thousands of RN-seeking students develop the comprehensive knowledge base and expert nursing assessment skills necessary for accurate collection of client data. The authors provide in-depth, accurate information, a compelling Continuing Case Study that covers every step in the assessment process, a focus on diversity and health assessment through the lifespan, a striking photo and illustration program that includes photos of practicing nurses performing assessments, dynamic online video clips and animations, and much more. This book provides students everything needed to master the knowledge and assessment skills needed for a successful nursing career.